The decision of Emily Thornberry to resign as shadow attorney-general – or Ed Miliband’s decision to sack her, depending on who you believe – must be one of the loopiest political acts of modern times. Rather than lance a boil, Labour has opened a deep self-inflicted wound. 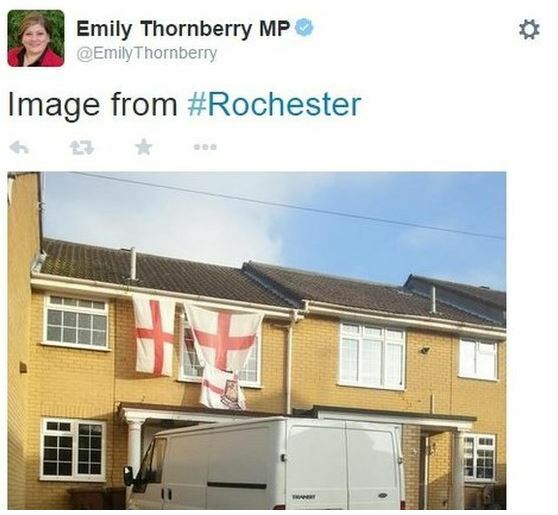 Having tweeted that infamous photo of a house in Strood, draped with St George flags and with a white van parked outside, at 3.30 pm yesterday Thornberry issued a further tweet three hours later, apologising if anyone had been offended. The party should have left it at that: the story would have blown over within a few days. Instead it may run and run for weeks or even months, because Thornberry’s subsequent departure indicates that Labour accepts the right-wing press’s charge that the tweet had “sneered at” people. In fact, it wasn’t sneering at all. The tweet (which carried the neutral three-word message “Image from #Rochester”) may, with hindsight, seem ill-judged given all the dog-whistle interpretations placed upon it in the last 24 hours. But taking a photo and posting it on Twitter is second nature to many people nowadays. And there’s no indication that anyone in Rochester and Strood was offended by it (save for the homeowner, once he was asked leading questions by a pack of tabloid journalists). Nigel Farage expresses fabricated outrage at Labour’s supposed hatred of “the concept of Englishness”, but this is an Englishness that I do not recognise. The English have an ability to laugh at themselves (think of seaside postcards and the recent “Crap Towns” phenomenon) and a love of the underdog, against which the witch-hunt against Emily Thornberry grates. Thornberry did not say, or even imply, that draping England flags over the front of your house makes you bigoted, ignorant or laughable. This is not a Gillian Duffy moment for Labour (Duffy being, in case you’ve forgotten, the Labour voter in Rochdale that Gordon Brown dubbed “some bigoted woman” during the 2010 campaign, unaware that his words were recorded by a Sky News microphone). But it could still become one if Labour continues to defend itself, and campaign, on the right-wing media’s terms. Ed Miliband had been, until recently, described as the new Neil Kinnock. It now seems that the media have moved on from presenting the Labour Leader as a Kinnockite windbag or “red Ed”. Now he’s looking more like the new Walter Mondale – the Democratic presidential candidate in 1984 who Ronald Reagan successfully portrayed as an east coast, elitist liberal who didn’t understand the aspirations or concerns of blue-collar voters (later dubbed “Reagan Democrats”). Similarly, UKIP and the Tories now want to portray the Labour frontbench as Westminster insiders who don’t understand Middle England, or the aspirations of white van man. Emily Thornberry’s departure only feeds this false narrative. Rather than panicking and sacking someone, Ed Miliband should have come out fighting and dismissed this as the storm in a teacup it so obviously is. Far from being a metropolitan elitist who “hates the concept of Englishness”, Mark Ferguson has reminded us that Thornberry was brought up by a single mother in a council house in Guildford (about as quintessentially English a town as they come). She’s a talented politician who won Islington South in 2005 with a majority of only 484 over an effective Lib Dem, Bridget Fox, who had been widely tipped to win. To force her resignation over one tweet, which insulted no-one, is absurd. So is the charge of snobbery: parts of the Rochester and Strood constituency are idyllically pretty and much less deprived than Islington, which has large areas of council housing alongside all those Georgian terraces. Labour’s problems in places like Rochester and Strood go much deeper than a single tweet from an Islington MP. Despite an excellent local candidate, Naushabah Khan, Labour gave up on the seat almost as soon as the by-election was called. Labour blogger (and former NEC member, candidate and Hackney councillor) Luke Akehurst is reported to have been chastised for daring to suggest that Labour should try and win. At least Thornberry spelt Rochester correctly. A few weeks ago I received a tweet from the London Regional Labour Party encouraging me to catch the “Rochford & Strood Campaign Express” (Rochford is a town on the opposite side of the Thames estuary, nearly 20 miles north of Rochester). That the London Labour Party can mis-name a cathedral city just 30 miles from London, and represented by a Labour MP (albeit under slightly different boundaries) as recently as 2010, says much about how lacklustre Labour’s campaign was. The only plausible explanation for the resignation/sacking was that it would make Emily Thornberry a convenient scapegoat for Labour’s lamentable performance in the by-election, at which its vote share slumped from 28% in 2010 to 16.8% yesterday. But news of Thornberry’s Tweet only emerged a couple of hours before polls closed on a cold November evening. The notion that her Tweet had any material difference to the outcome of the by-election is fanciful. I only made it out there to campaign once, and found the reaction on the doorstep more positive than expected. Others report hostility from former Labour voters who had defected to UKIP – but this was days, or even weeks, before Emily Thornberry’s election-day visit. Although Labour was never likely to win the election, if we had fought harder and come second behind UKIP, or even a closer third, then the spotlight would now be on how badly the Tories did, not Emily Thornberry’s Twitter account. Instead we relied on UKIP to inflict damage on the Tories. Of the 210 constituencies in the south of England outside London, only 10 are now represented by Labour MPs. It’s difficult to see a path to victory for Labour in 2015 that does not pass through Rochester – a bellwether seat with unemployment levels and demographics close to the national average – or other large southern towns like Swindon, Milton Keynes, Reading and Portsmouth, which all had Labour MPs for 13 years from 1997 but where Labour lost heavily in 2010. Appearing to agree that Labour has “sneered” at voters in places like this only makes the task of winning them back harder. Labour has patronised the voters many times recently without anyone resigning, so it’s ridiculous that a good shadow minister has resigned for patronising voters only subconsciously, if at all. Demanding, or accepting, Emily Thornberry’s resignation was an unforced error by Ed Miliband that he will come to regret. This entry was posted in Uncategorized and tagged Elections, Labour, Politics, Rochester and Strood, UKIP. Bookmark the permalink.